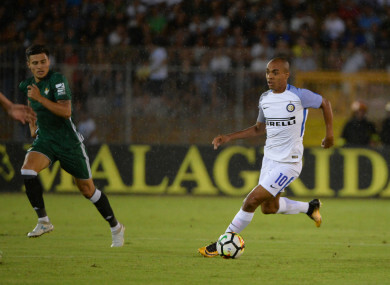 Joao Mario hasn't lived up to expectations at Inter. Portugal midfielder Joao Mario has been at Inter Milan since they paid €40 million to Sporting Club for his services in August 2016. That move hasn’t been a huge success and the 25-year-old looks set to join West Ham on loan before the 31 January deadline. Inter themselves are hoping to sign Liverpool’s out-of-favour striker Daniel Sturridge and Javier Pastore from Paris Saint-Germain. Another player who has failed to live to his price tag is Lazar Markovic. Signed for £20m (which was a lot more back then than it is now) from Benfica in the summer of 2014, the Serbian hasn’t played for the Reds since May 2015. However, after loan spells at Fenerbahce, Sporting Club and Hull City, the winger has been completely frozen out by Jurgen Klopp. According to reports, Lokomotiv Moscow, Anderlecht, Celta Vigo and Espanyol are monitoring the situation, with the Russian club showing most interest. Southampton would like to bring in Argentine striker Guido Carrillo from Monaco this month. The 26-year-old will cost around €22m, while the Saints are also keen to add Spatak Moscow winger Quincy Promes to their ranks for around €34m, according to the Telegraph. Meanwhile, West Brom have reached an agreement with Egyptian club Zamalek for defender Ali Gabr, who will join on loan initially with the option to buy at just £1.5m. Bray native Ronnie O’Brien was signed by Middlesbrough as a teenager, having played in Ireland’s youth teams. Let go by the club two years later, however, Italian giants Juventus offered the midfielder the chance to move to Turin on a whopping five-year deal. It remains one of the most surprising transfers ever involving an Irish footballer and O’Brien was on the books at Juve between 1999 and 2002, which included loan spells at AC Lugano, Crotone, Lecco and Dunndee United. He didn’t manage to make a first-team appearance for the Old Lady and headed off to the US to join FC Dallas in 2002. O’Brien would go on to have a hugely-successful career in the MLS with Dallas, Toronto FC and San Jose Earthquakes — winning four MLS All-Stars. Steve Staunton is believed to have contacted O’Brien about representing Ireland during their US tour of 2007, but he opted to turn it down and concentrate on club football. Email “Euro 2016 winner on his way to London from Inter and all today's transfer gossip ”. Feedback on “Euro 2016 winner on his way to London from Inter and all today's transfer gossip ”.